Frank Lala '78 has been honored with numerous awards for his work on behalf of the deaf and hard-of-hearing community. It’s clear that Frank Lala ’78 (Community Health Education) has affection for quoting important thinkers and doers. People often use quotes to inspire. For Lala, it’s fitting. He has been an inspirational force for the Deaf and hard-of-hearing community, particularly those who battle substance abuse, for the past four decades. Lala is a vocational rehabilitation counselor for the Department of Human Services in Georgia. 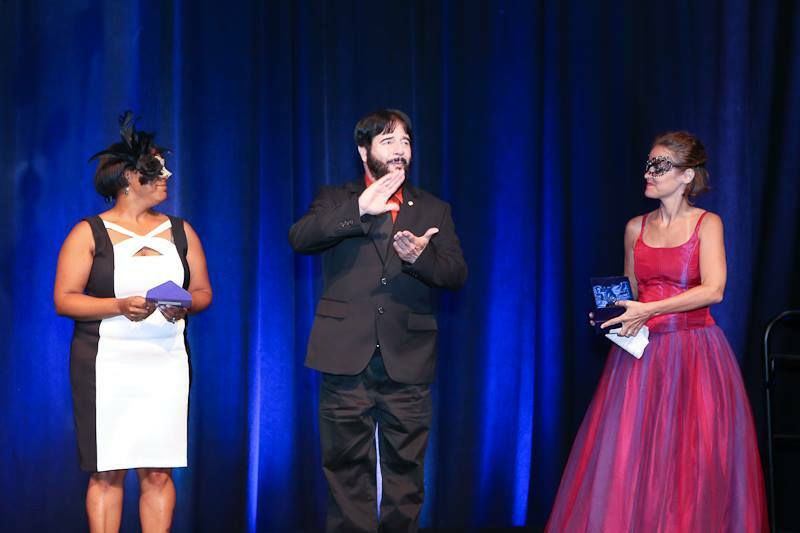 Lala recently was honored at the Registry of Interpreters for the Deaf, Inc. national conference with the Marie J. Philip Award. The award goes to a deaf individual who has shown significant dedication to and involvement in the field of interpreting on local, regional and national levels. The award is named after the late pioneering American Sign Language teacher and researcher who is regarded as one of the country’s most important sign language and Deaf culture advocates. Lala began to lose his hearing at age 5 after a toxic reaction to tonsillitis medication. He has dedicated his life’s work to bettering the lives of people who share the same challenges he has. But he is also passionate about ridding the Deaf community of alcoholism and substance abuse. “Early on in my star-crossed life, I had lost most of my immediate family to drug abuse,” Lala said. “As a consequence, by the time of my graduation from high school, I stood alone and uncertain at the threshold of a very frightening future. I suffered and sustained the anguish of what substance abuse did to my life, family and friends. I swore that as long as I lived, I would not drink any alcohol, use drugs or smoke. Lala’s drive began early. He attended the California School for the Deaf in Riverside and then Riverside City College, where the coordinator of the deaf program suggested he attend CSUN. He enrolled at CSUN in 1971 and said that during his time here he met many individuals who helped elevate and motivate him. After CSUN, Lala earned a certificate in performing arts from UCLA, a master’s in education from Western Maryland College and a Ph.D. in health and human services. In the years since school, Lala has dedicated his talents in different ways to help the Deaf and hard-of-hearing. He was a co-founder of a recovery program for Deaf and hard-of-hearing alcohol and drug abusers in Southern California. He has written articles, contributed to journals and wrote the book Counseling the Deaf Substance Abuser. He has lectured and been a go-to speaker on the topic at numerous conferences. Lala also founded the American Martial Arts Association of the Deaf. He holds black belts in karate and jujitsu. Lala founded the Chatham County Association of the Deaf in Georgia. He has promoted the provision of interpreters and the use of video relay services in hospitals and healthcare centers, and he has educated the public via speaking engagements, presentations and media about the needs and rights of individuals who are deaf or hard of hearing. He is also the president of the Georgia Association of the Deaf (GAD). 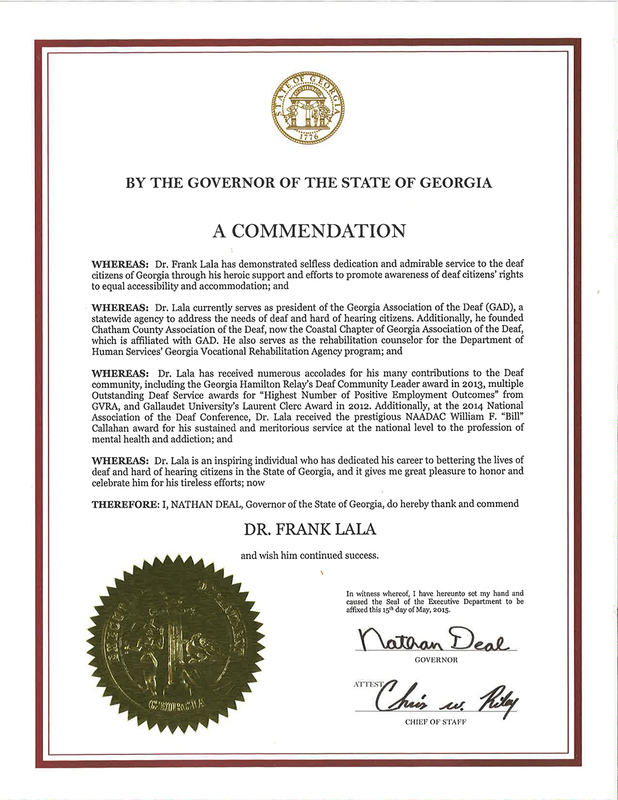 Lala has been recognized for his work by the California School for the Deaf Riverside Alumni Association, Western Maryland College, Gallaudet University, the Georgia Association of the Deaf, Chatham County Association of the Deaf and has received commendations from Georgia Gov. Nathan Deal and Savannah Mayor Edna Branch Jackson. “His greatest strength is as a leader,” said Becky Sills, who was the director of the Georgia Vocational Rehabilitation Deafness Program until her retirement in December. “He identifies needs and works on a plan to try to meet that need, whether it’s with his clients or in the community. The Marie J. Philip Award recognized Lala for the breadth of his work. He participated in panels to educate landlords, realtors and property management companies about their responsibility to provide access to the Deaf community through interpreting services and video interpreting services. He also partnered GAD with the Georgia Registry Interpreters for the Deaf (GaRID) to work collaboratively to enhance the lives of the Deaf and hard-of-hearing community in the state. In June, Lala and GaRID President Erin Salmon signed a memorandum of understanding in front of National Association of the Deaf President Chris Wagner and Jared Patton, the coordinator of deaf services for the state of Georgia, solidifying the unity between the two groups. GAD and GaRID are dedicated to developing a collaborative platform in which both organizations can develop and share ideas on how to benefit each other. Lala’s passion for leading his community is never-ending. He said he hopes universities will one day offer certification programs for Deaf students in the areas of alcohol and drug rehabilitation. There is a need and demand for more insightful and caring bilingual and bicultural counselors, intake personnel, therapists and other professionals, he said. We don’t choose to be the common linguistic minority. It is our right to be the uncommon and noble linguistic minority. If we can, we seek opportunity, not security. We don’t wish to be “kept” citizens, humbled, dulled by having the state look after us. We want to take the calculated risk to dream and to build, to fail and to succeed. We want to abolish stereotyping and to remove the prevalent public mentality toward prejudice. We will not tolerate biased perceptions, criticisms or censures of our beloved American Sign Language. We will not accept abuse of our Deaf identity by oppressors, nor our rights to self-determination. We prefer the challenge of life to a guaranteed existence; the thrill of fulfillment to the stale calm of Utopia. We will never cower before any master, audism or paternalistic attitudes, nor bend to any threat of discrimination. All of this is what it means to be Deaf Americans.